The HP Network ScanJet 6 was relabelled as HP Digital Sender 9100C. It looks like the HP Network ScanJet 5 I convert/upgrade for customers, except the HP Network ScanJet 6 / HP 9100C Digital Sender 9100C has a fuller keyboard than the HP Network ScanJet 5. I offer a tentative commercial conversion/ upgrade service as they look similar, & I've converted numerous HP Network ScanJet 5s for customers before. Standard Reply To FAQ: "What Would It Cost for a 9100C upgrade ?" 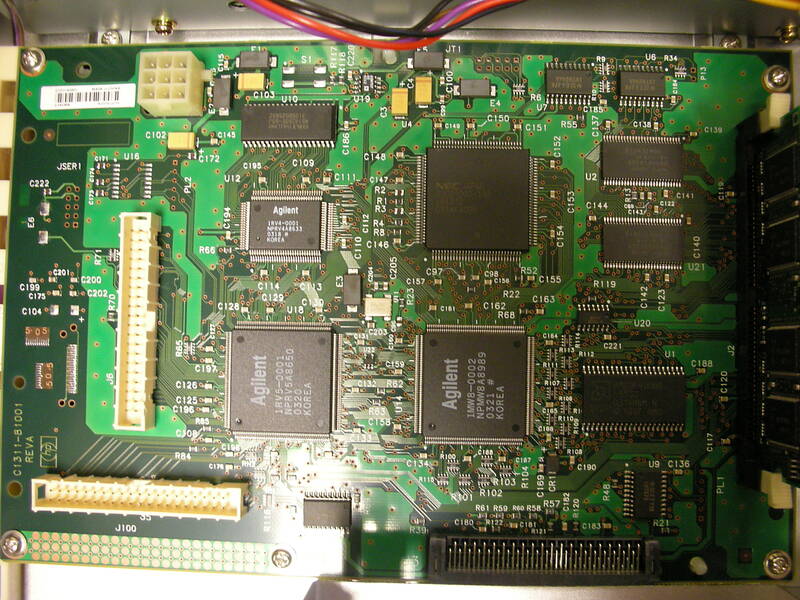 I haven't yet physically had an HP Network ScanJet 6 / HP 9100C Digital Sender 9100C to examine & convert. I could send a hard disk configured with several kernels, one of which should work with whatever ethernet you have ? Then you probably need more RAM, How much do you have ? What Type ? Free Slots ? if FreeBSD doesn't then see SCSI scanner, (because of HP's unusual IRQ, as on Net Scanjet 5 http://www.berklix.com/scanjet/ , I could email you a new kernel to install. The combi keyboard + display is different to the previous Net Scanjet 5, (more keys, & LCD screen bigger perhaps, hardware & software interface unknown, I'd probably need at least that. You would need to find & pay for packing container, shipping (http://www.berklix.com/scanjet/#ship) & optional insurance to & from Munich, Germany, Europe. Into Europe then back to you: We would both have to find out how to label it each way, Perhaps: "Temporary import/export for repair", or if you have a spare one: "No commercial value, gift to autopsy for interest" or whatever else. (For the Net Scanjet 5 its easier, sending a small non fragile package one way. If you prefer this route, I could email a standard offer for a Network Scanjet 5 conversion, as a basis on which to calculate. Free Alternative: Do the work yourself, if you have the skill & time. I host a free mail list where people skilled with the predecessor model would be happy to discuss. If anyone knows other similarities or differences, other than documented here, please mail me detail http://www.berklix.com/~jhs/mail/. More photos from digital cameras welcome, or ideally a dmesg from FreeBSD, to help decide if one might do the job as per a HP Network ScanJet 5, just sending discs, ethernet & ram (a lot lighter, less fragile, & less trouble than a whole scanner). HP's Product spec says "B/W document, color document, B/W or color photo" It may need a lot more memory than the HP Network ScanJet 5 which can get away with just an 8M plug in during upgrade (then again, the HP Network ScanJet 6 / HP 9100C Digital Sender 9100C may come new originally configured with enough memory for colour scanning at maximum (but what?) resolution & colour depth. Picture dscn1637.jpg show 4 chips number 48LC2M8A1. So that's 8 M byte. No space on board for more than one memory module as right of hp9100c/dscn1634.jpg shows no space for a 2nd slot. So memory module is 8M: uncomfortably tight for FreeBSD-4.11, depending on kernel size, might not run, (FreeBSD-8.1 wants more). too small for scanning colour ?. "HP 9100c Digital Sender - Product Specifications"
HP Sales Leaflet in German. Nice - but that needs more memory & different parameters to scanner software. Which bus (upward from ISA to PCI perhaps ? Colour : Trevor B. reckons that's what the C at end of 9100C stands for. Need to calculate implications on memory for scan buffer etc & parameters. Board pics from Trevor B. show on back: C131161001 , generates lost of hits on google. "No replacement product is available for this discontinued product" HP quote from Admin guide pdf "Network servers are needed only to connect LAN fax and other programs. No network servers are needed to support the remaining features. The HP 9100C Digital Sender works correctly with the Microsoft TCP/IP protocol provided as part of these operating systems." 20 GB HDD with the HP 9100C s/w It is some variety of Linux that drives the unit (or maybe just the embedded web server) The HDD has 4 partitions. 3 with FAT16 one with Linux. The unit does NOT require a Windows type server to operate. You do need an external SMTP server for sending email. You can create a share on a Windows PC and directly scan to it via SMB. i believe you have underestimated the difficulty involved, as i understand it these devices run a MIPS processor and ship with vxWorks by default.